It was Luke and Avery's 13th birthday, so we figure it was perfect timing to enter them into their first golf tournament. If they're going to make it into the Master's Tournament before they turn the age of 14, we figured we'd better start picking up the competition pace a little bit. Since it was her grandson's birthdays, we thought we'd drag Grandma Linda along with us. She's always been a bit of a Golf Nut! Well, maybe not the golf part. She liked watching the golf, but loved hanging out in the shade! Not a big fan of the heat, that one. 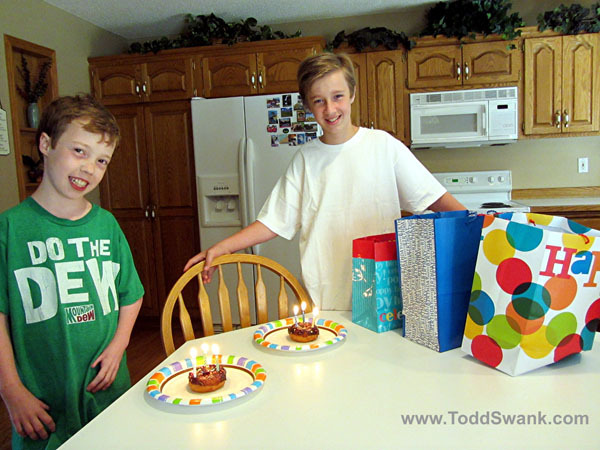 At approximately 1:02 and 1:04 PM, our little baby boys became teenagers. Luke is the older of the twins. And he just loves to be able to tell people that he's the Big Brother, at least chronologically that is. Avery ended up scoring a 2 over Par 29 on the Eagle Lake Birdie Couse which was good enough for 2nd place in the tournament. He won some new balls which makes him proud. Luke was only a few strokes behind his brother which took him out of prize contention, but he knows he's a winner in the fact that he is already a better golfer than his father. After the tournament, we enjoyed a birthday feast at Benihana in Golden Valley. MMMMMM, Boy! We sure love that Teppinyaki Style Cooking! We stopped by to see our friend, Chad Hornbuckle, who was in a hospital nearby. Although it had only been a couple of days after his recent kidney transplant, Chad was still as ornery as ever! We had a neat surprise when we learned that Chad's Nurse Char coincidentally was going to be spending the next 5 days with Luke and Avery away at Camp Odayin! But as my boss Dr. Bollig always likes to say, I'd still hate to carpet it. Ultrabooks: Market Savior or Hopeless Failure? Happy 13th Birthday, Luke and Avery! !